WILLIAM E. ARON was born in New Jersey in 1923. He was the son of Emil Aron and Harriet Aron, of 28 West Beechwood Ave Oaklyn NJ. The Arons had lived in Pennsylvania, where older sister Henrietta was born, before moving to Oaklyn, to the home of father-in-law Robert Gleason. By 1930, the elder Aron was a Sergeant on the Oaklyn police force, and a younger brother, Donald Aron, had joined the family. Two other children were born, Edward, who died while an infant, and David, born in 1935. Emil Aron and his brother David were also well known as baseball umpires in the late 1920s. 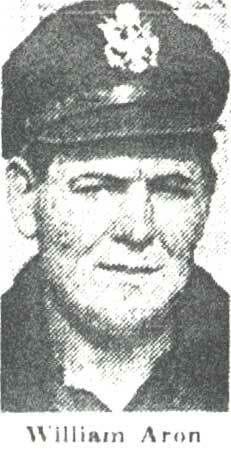 William Aron graduated from Collingswood High School in 1941. Nicknamed Will, his hobbies were hunting and fishing, and raising and racing homing pigeons. He had hoped top become a chemical engineer. William Aron enlisted in the Army Air Force on October 17, 1942 and was activated on January 30, 1943. Prior to his activation he had learned to fly at Central Airport just outside Camden in Pennsauken NJ, where he received instruction from a female pilot who lived in nearby Haddon Township. 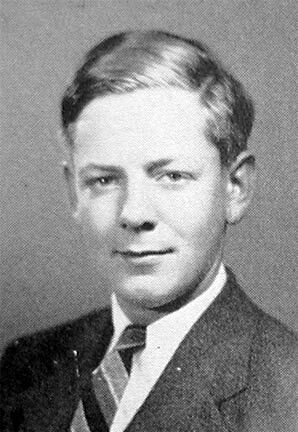 Once he reported for active duty, William E. Aron was sent to Atlantic City NJ, and then to Butler University in Indianapolis IN. 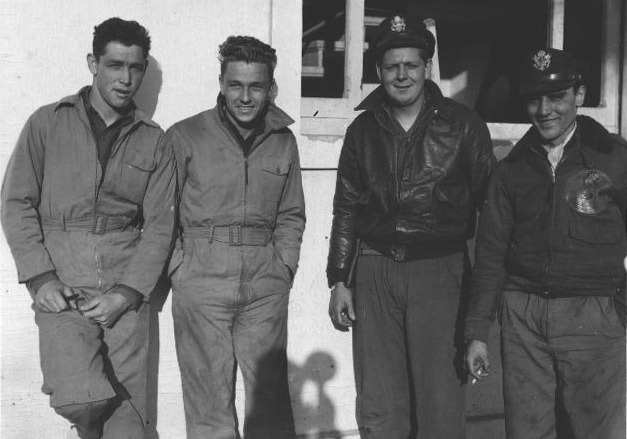 After Butler University he received training at the Aviation Cadet Center in San Antonio TX, and at three other Texas airfields, Bruce Field, Perrin Field, and Foster Field. Where he graduated as a fighter pilot on April 15, 1944. He then saw duty at Harding Field in Baton Rouge LA, and at Brunning NE where he was trained on the P-47 Thunderbolt fighter. A brief spell was spent at Pierre SD where he took gunnery training. While in Texas he met his girlfriend Jessie. Once overseas he named his fighter for her, painting the words Texas Jessie on the fuselage. On October 11, 1944 he sailed from Fort Patrick Henry VA to Bari, Italy arriving November 9, 1944, and eventually was assigned to the 318th Fighter Squadron, 325th Fighter Group, based in Foggia, Italy. The 318th moved to another base, Lesina Aerodrome, 35 miles north of Foggia. 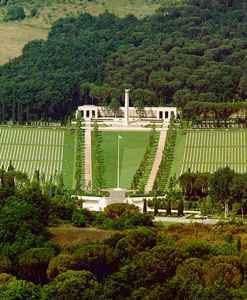 where they remained until March of 1945. During this period in early 1945 Wiliam Aron was awarded the Air Medal. The 318th moved again, to Rimini Airdrome at Miramare, Italy, where they remained until April 2, when the squadron moved to the Mondolfo Airdrome. 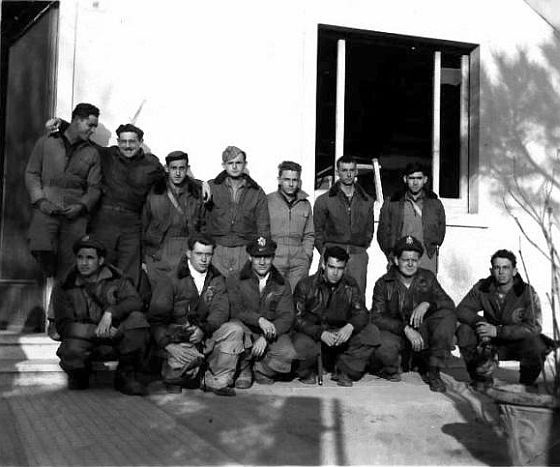 While stationed at Rimini, On March 14, 1945 Lieutenant Aron and other members of the 318th Fighter Squadron engaged a large group of German Focke-Wolf 190 fighters while escorting heavy bombers on a raid over Nove Zamke, Hungary. The pilots of the 318th destroyed at least 18 enemy fighters, and damaged three more to greater or lesser degree. First Lieutenant Gordon H. McDaniel shot down five of these aircraft himself, thus becoming one of the few American pilots to achieve ace status in a single day. Lieutenant Aron is also credited with having brought down at least one German aircraft. The following day, Lieutenant McDaniel was interviewed by and described the action to ABC radio reporter Clete Roberts. First Lieutenant William Aron flew a total 43 missions, flying the North American P-51 Mustang fighter, and was credited with shooting down five Axis aircraft, qualifying him as an ace. 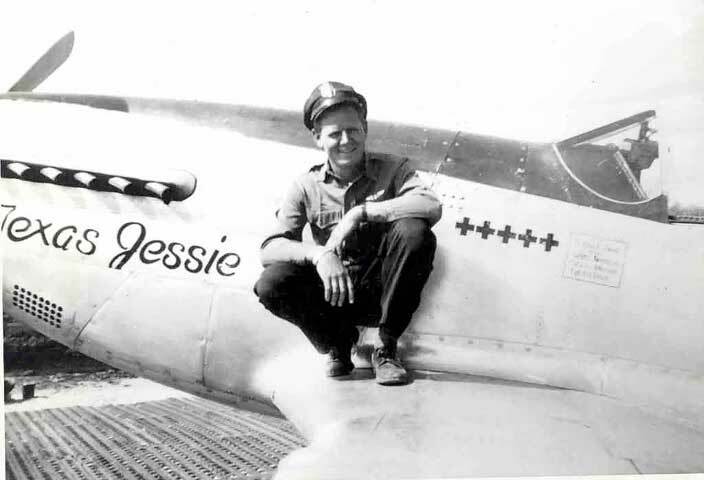 On April 22, 1945 his plane, #44-15128, also known as Texas Jessie, was shot down over the Po River valley. 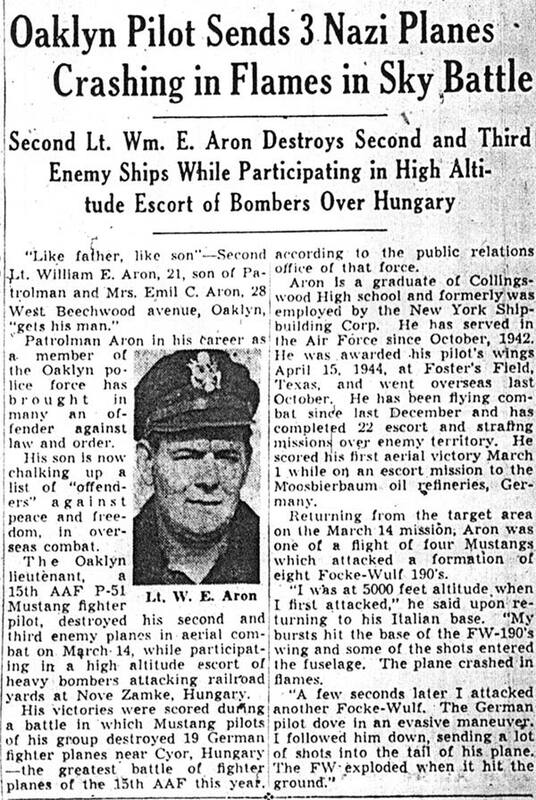 First Lieutenant William E. Aron was reported to have been taken alive from his plane, and escorted away by unfriendly villagers. No further information was ever given to his family, and his body was never recovered. The Army declared him dead on April 23, 1946. William E. Aron's passing had a profound effect on the Aron family. Emil Aron passed away a mere three years after word of his son was brought to him. His family remained in the area. William E. Aron's younger brother David went on to become Camden County's Fire Marshal, serving in that capacity for 23 years. A cousin, Private First Class Herbert Lokan, was killed in action on June 13, 1944, one week after parachuting into Normandy on D-Day.